June being the wedding month, herewith follows some advice, circa 1833, regarding the proper conduct of married persons toward each other. Of propriety of conduct in conjugal and domestic relations. To entertain with a politeness particularly affectionate the friends of a person with whom you are connected by marriage; to respect inviolably the letters which she writes or receives; to avoid prying into the secrets which she conceals from you through delicacy; never to act contrary to her inclinations, unless they are injurious to herself, and even in this case not to oppose her, but to endeavor to check them with address and kindness; to beware of confiding to strangers or to domestics the little vexations which she causes you; to dread like poison marks of contempt, coldness, suspicion, or reproaches; to apologize promptly and in an affectionate manner if you have allowed yourself to run into any ill humor; to receive her counsels with attention, and benevolence, and to execute them as quickly as possible—these are the obligations of propriety and love, to which husbands possessed of gentleness bind themselves, by the sanctity of the vows which they have taken before God. 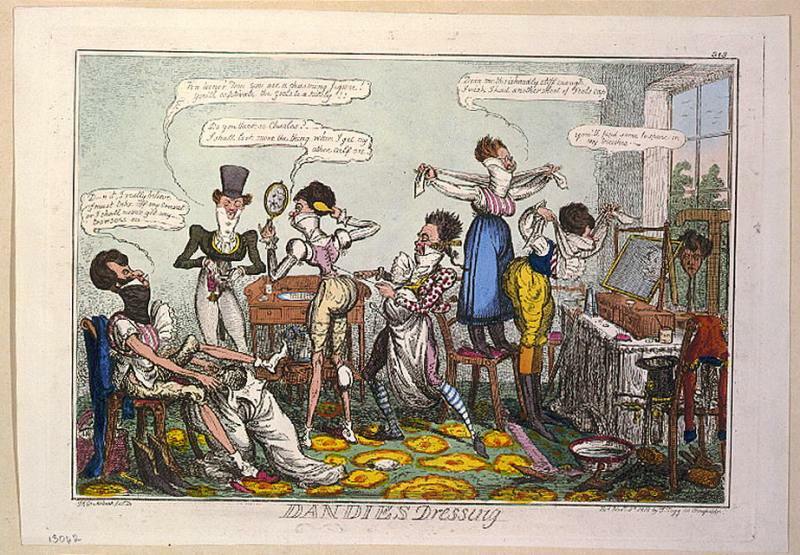 * As washing the feet, cutting the nails, &c.
Elisabeth Celnart, The Gentleman and Lady's Book of Politeness and Propriety of Deportment: Dedicated to the Youth of Both Sexes. Translated from the French. We here at the TNHG don't usually post on Saturdays, but this particular Saturday seemed too historically momentous to let pass by unnoticed. 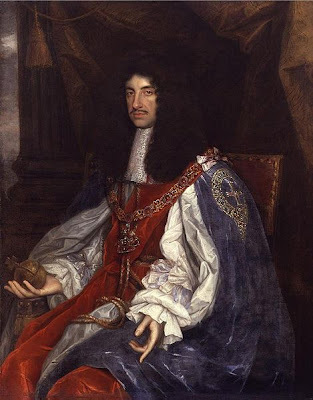 May 29th is not only the 350th anniversary of the return of King Charles II (1630-1685) to London after his lengthy exile, but also his 380th birthday. I've written five historical novels in which Charles has featured prominently, and after those 600,000 or so words between us, I do feel I owe him the very best wishes for the day. "This day, His Majesty, Charles II, came to London, after a sad and long exile and calamitous suffering both of the King and the Church, being seventeen years. This was also his birthday, and with a triumph of above 20,000 horse and foot, brandishing their swords, and shouting with inexpressible joy; the ways strewn with flowers, the bells ringing, the streets hung with tapestry, fountains running with wine; the Mayor, Aldermen, and all the companies, in their liveries, chains of gold, and banners; Lords and Nobles, clad in cloth of silver, gold, and velvet; the windows and balconies, all set with ladies; trumpets, music, and myriads of people flocking, even so far as from Rochester, so as they were seven hours in passing the city, even from two in the afternoon till nine at night. "I stood in the Strand and beheld it, and blessed God. And all this was done without one drop of blood shed, and by that very army which rebelled against him: but it was the Lord's doing, for such a restoration was never mentioned in any history, ancient or modern, since the return of the Jews from their Babylonish captivity; nor so joyful a day and so bright ever seen in this nation, this happening when to expect or effect it was past all human policy....The eagerness of men, women, and children, to see His Majesty, and kiss his hand, was so great, that he had scarce leisure to eat for some days, coming as they did from all parts of the nation; and the King being as willing to give them satisfaction, would have none kept out, but gave free access to all sorts of people." From the Diary of John Evelyn, which has recently (finally!) become available for on-line reading here. 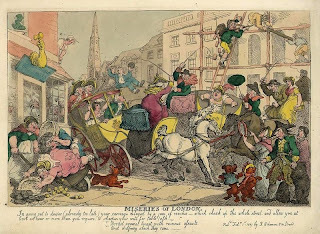 A lively Rowlandson illustration of a London street scene sent me to the material it illustrated, from one of my favorite books from the Regency era, James Beresford’s, The Miseries of Human Life. Though written in 1807, it proves that some aspects of human life haven't changed. The wait in a public office might, for instance, remind some of us of our last visit to the Registry of Motor Vehicles, while others might relate to the “hurry and ferment” of a recent visit to, say New York City. And who hasn’t dropped money in a taxicab? While on a short visit to London—the hurry and ferment— the crossing and jostling—the missing and marring—which incessantly happen among all your engagements, purposes, and promises, both of business and pleasure—at home and abroad—from morning till midnight;—obstacles equally perverse, unexpected, unaccountable, innumerable, and intolerable, springing up like mushrooms through every step of your progress. Then, (when you are at last leaving London,) on asking yourself the question whether any thing 'has been neglected, or forgotten, receiving for answer—"Almost every thing!" In going out to dinner, (already too late,) your carriage delayed by a jam of coaches which choke up the whole street, and allow you at least an hour more than you require, to sharpen your wits for table talk. In attempting to pay money in the street—emptying your purse into the kennel—the wind taking care of all the paper money. The unintermitting fever into which you are thrown by being obliged to linger, the whole morning long, amongst a crew of " greasy rogues," in the outer room of a public office, from which you are called out the last—if, indeed, you are called out at all! In taking out your money in a hackney-coach—dropping the greatest part of it (and all the gold) in the straw then, After grubbing and fumbling after it for an hour, finding nothing but the gaping crevices through which it must have escaped. If June belongs to roses, then surely May is the month for peonies. Peonies seem to me to be sumptuously old-fashioned flowers, which earns them a worthy place at the TNHG. And as flowers go, peonies are very old flowers, more than old enough to qualify as historical. Peonies have been grown in China for thousands of years, though at first they were primarily revered not for their blooms, but for their medicinal purposes. In traditional Chinese medicine, the bark of tree peonies and the roots of herbaceous varieties were used for cooling the blood and relieving both pain and infections. In medieval Europe, peonies became a favorite cure-all, recommended for relieving everything from gallstones, childbirth pain, epileptic seizure, and the ever-popular evil spirits. more extravagant blooms, his artists, too, were inspired by the flowers, and peonies can be found not only in Chinese screen paintings and woodblocks, but also woven into tapestries, embroidered in silk, and glazed onto porcelain. By the eighth century, the Japanese had discovered ornamental peonies as well, but Western Europeans had to wait another thousand years. In 1789, legendary naturalist and botanist Sir Joseph Banks commissioned a tree peony to be brought to England by way of the British East India Company, and planted this first tree peony in Kew Gardens. The flowers remained difficult to obtain until the later 19th c., when English and American gardeners eagerly began developing varieties of their own. 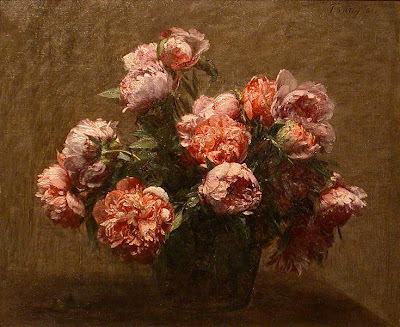 With their air of the exotic, the lush flowers became favorites with Western artists in the 19th c., too, and appear in paintings by Renoir, Whistler, and Fantin-Latour as well as in Art Nouveau posters. What better captures the full-blown fin-de-siecle that a porcelain bowl overflowing with peonies? I'm fortunate to live near the Winterthur Museum and Country Estate, and can enjoy their fabulous Peony Garden. Established nearly a century ago, the garden has hundreds of peonies of every variety and in colors that range from palest white to deep bronze. It's literally breath-taking, and well worth a visit if you're near Wilmington, DE in May. The photographs here were taken at Winterthur last year by my daughter; you know it's an impressive garden when its beauty captivates a teenager! Divorce in England in the 19th century required an Act of Parliament. Only the rich could afford it, and many couples remained legally bound in misery (usually the misery was on the wife’s part). But for the lower orders, there was another method. The method was wife-selling, and Ashton goes on to give examples, gleaned from various periodicals. Morning Herald, March 11, 1802: "On the 11th of last month, a person sold, at the market cross, in Chapel en le Frith, a wife, a child, and as much furniture as would set up a beggar, for eleven shillings!" Morning Herald, April 16, 1802: "A Butcher sold his wife by auction the last market day at Hereford. The lot brought £1 4s. and a bowl of punch." 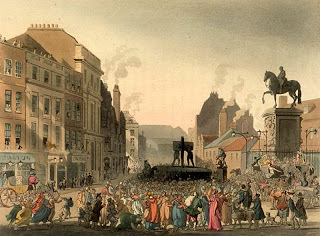 Annual Register, February 14, 1806: "A man named John Gorsthorpe exposed his wife for sale in the market, at Hull, about one o'clock ; but, owing to the crowd which such an extraordinary occurrence had gathered together, he was obliged to defer the sale, and take her away. About four- o'clock, however, he again brought her out, and she was sold for 20 guineas, and delivered, in a halter, to a person named Houseman, who had lodged with them four or five years." 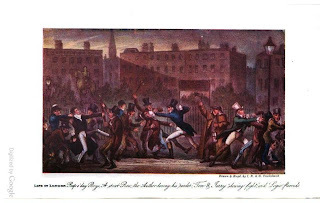 Morning Post, October 10, 1807: "One of those disgraceful scenes, which have, of late, become too common, took place on Friday se'nnight at Knaresborough. Owing to some jealousy, or other family difference, a man brought his wife, equipped in the usual style, and sold her at the market cross for 6d. and a quid of tobacco !" 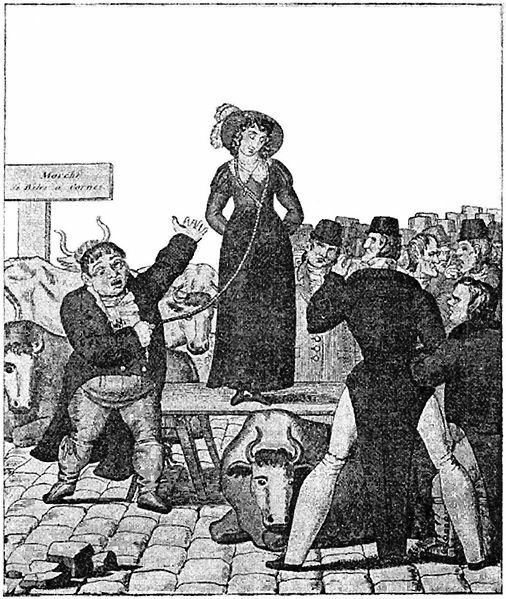 In the Doncaster Gazette of March 25, 1803, a sale is thus described : " A fellow sold his wife, as a cow, in Sheffield market-place a few days ago. 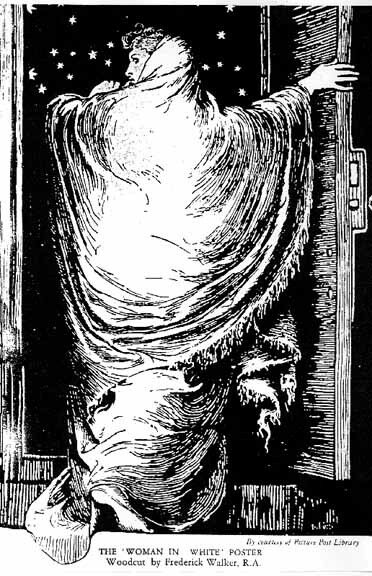 The lady was put into the hands of a butcher, who held her by a halter fastened round her waist. 'What do you ask for your cow?' said a bystander. 'A guinea,' replied the husband. 'Done!' cried the other, and immediately led away his bargain. We understand that the purchaser and his 'cow' live very happily together." 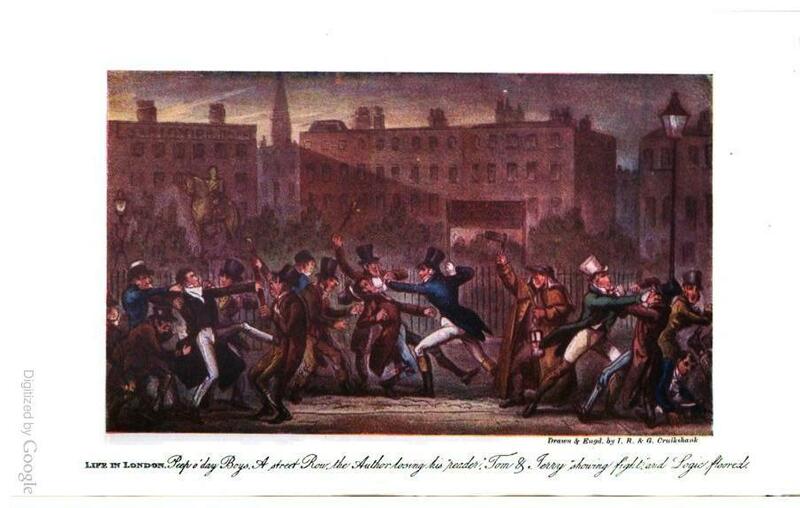 John Ashton, The Dawn of the XIXth Century in England: a social sketch of the times. I love painted portraits, and seeing how a skilled artist can reveal the most subtle nuances of character and experience with only a brush and paint. But a photographic portrait can be equally fascinating, and equally revealing, too, in a far different way. The old saying claims that a camera never lies (at least it didn't before Photoshop), and the earlier the camera, the more truth there is in the image. The harsh bright lights and unwavering poses required by 19th c. technology forced sitters to confront the camera with a frank immediacy that leaps over the decades. I have no idea of the identity of the intense young gentleman, left. I scanned him from my great-great grandmother's album, where none of the pictures are identified. She knew who everyone was, and a good thing, too. As a very young woman before the Civil War, she left her family's farm back east and traveled across the plains and mountains to teach school in Marin County, CA. She would never return, nor had she expected to. Her album would have her last connection with old friends and family, and I've always wondered what this sharp-eyed gentleman meant to her. 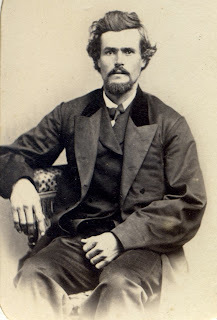 From his vertical hair (all the rage mid-century) and the stylishly loose fit of his coat, I'm guessing his picture dates from the 1850s, with his birthdate twenty-five years before that. But what's 180 years with a gaze like that? The picture of the gentleman, right, is even older. 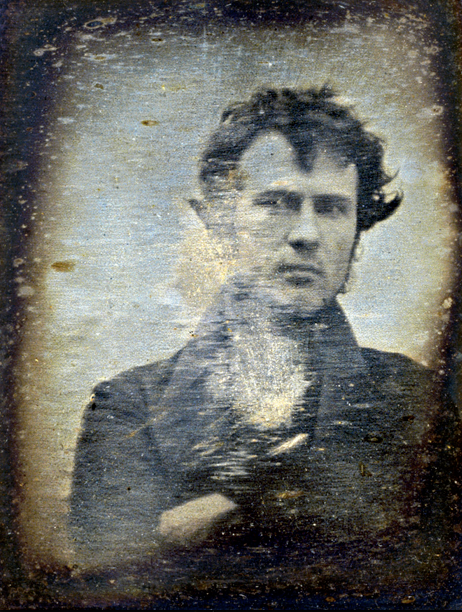 In fact it's one of the earliest surviving American daguerreotypes, dating from 1839. Philadelphia chemist and silversmith Robert Cornelius (1809-1893) was fooling around with the new process, and took this picture of himself outside his shop. His hair is tousled, his pose hastily informal, and he's squinting both at the camera and the sun: but how amazing to be able to look into the eyes of someone born more than two hundred years ago! I'm not the only one fascinated by old images like these. Recently several other blogs have featured evocative early photographs. Versailles & More has a remarkable video drawn from photographs of the veterans of Napoleon's armies. The Sartorialist invited readers to contribute vintage family shots, with amazing results from around the world. Most heart-breaking of all, however, are the images of adolescent girls to be found at It's About Time. These girls were inmates in the Welsh prison of Newport Usk Gaol in the 1870s, and the pictures were taken of them upon their release. Their crimes were petty, mostly theft. Their sentences all included hard labor. The oldest girl is sixteen; the youngest eleven. At left is Selina Jenkins, age twelve, who served fourteen days hard labor for stealing a cloth jacket. 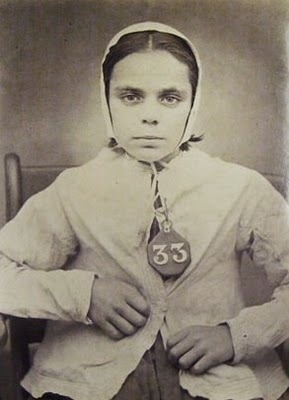 Hanging around her neck is a tag with her prison number, and her expression seems exhausted and wary, yet resigned as well. Could there be a more achingly truthful portrait? 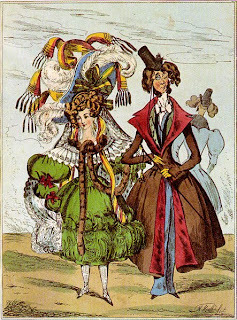 According to Beau Brummell, "If people turn to look at you on the street, you are not well dressed." The leader of the Dandies was all about perfect tailoring and simplicity—understated style. 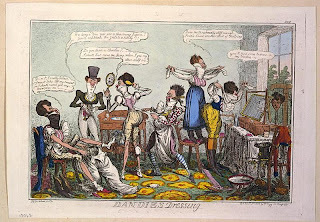 But not everyone got it—or wanted to—and the term "dandy" has probably been more frequently one of ridicule, as the following poem and accompanying illustrations indicate. FROM A DIDACTICAL SKETCH RECENTLY PUBLISHED, ENTITLED " FASHION." Till lately in the realm of Fashion found. Its very sister laugh'd to call it brother;"
Procur'd it notice—'twas so strange a creature. The loveless pair in Christian mode were married. Below right: "Waist and Extravagance", by W. Heath, ca. 1830. We're putting aside our blogger-hats to don our shamelessly self-promoting author-hats instead. Both of us have books scheduled for release in the coming months. Both of us, too, have recently updated our websites with more info about these books. We've also posted excerpts – just enough to introduce you to our characters, mind you. We hope it's enough to tempt you further! Because it's such a splendid, sunny day, I thought we'd take our demi-landau out for ride in the park. Well, okay, so it's not exactly ours. It's part of the Colonial Williamsburg carriage collection, and the oldest of the original (not replica) ones. Also known as a diligence or chariot, the demi-landau was a variety of private carriage popular well into the 19th c. With a single seat facing forward (an ordinary landau is larger, with two facing seats), they offered passengers an unobstructed view for traveling, particularly if driven by a postilion on horseback. According to our favorite CW driver Susan Cochrane (and our driver for today), postilion is also easier on the driver; it's much more comfortable to ride in as saddle for a day's journey than on a hard coach box. 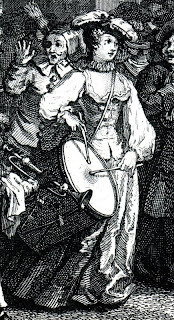 Demi-landaus were the most widely used form of personal carriage. Their smaller size made them useful for maneuvering narrow city streets as well as for country roads, and the smaller size also made them more economical. A nicely appointed demi-landau cost around £115. This was still out of the price range of the vast majority of 18th c. Englishmen, but for the rising middle class, a demi-landau was often the first prestigious step in "keeping" a carriage. 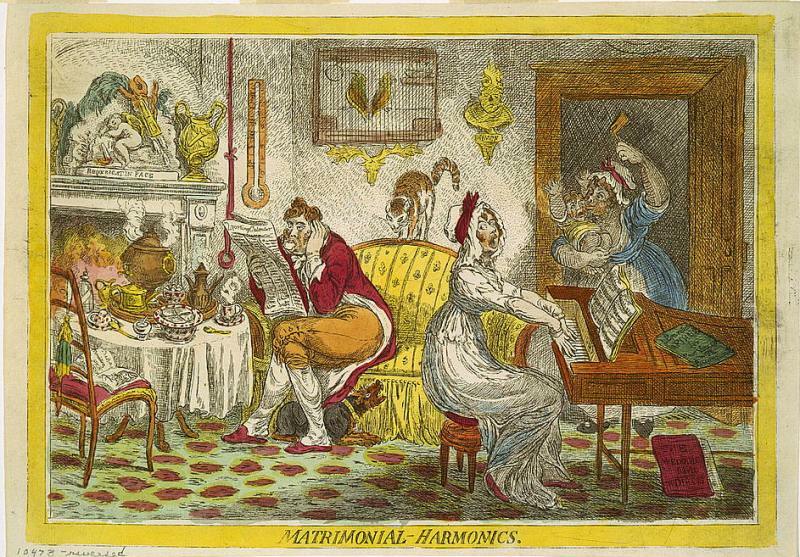 Regency fans take note: Jane Austen and her characters would have been completely at home in a demi-landau, too. For more about carriages of all kinds, including up-to-date prices for 1794, check out William Fulton's Treatis on Carriages: Comprehending Coaches, Chariots, Phaetons, Curricles, Whiskeys, etc. But enough talk. Here's another of my mini-videos to give you a short ride in the CW demi-landau. Take special note of how those folk of the middling sort, riding packed together in a public conveyance, will all gawk at you in envious wonder as you pass them in your solitary splendor. For more about other carriages at Colonial Williamsburg, see here, here, and here. ORIGIN OF THE NAMES OF THE PRINCIPAL BUILDINGS, STREETS, &c. IN LONDON AND WESTMINSTER, FROM STOW, SPEED, MAITLAND, &c.
ADDLE-STREET is in old records called King Adel-street, from King Adelstan the Saxon. Ave-Mary-lane was so called in the Popish times, from text-writers and bead-makers who dwelt there. Barbican took its name from a watch tower, or burkenning, which stood there, and destroyed by Henry III. in 1267. 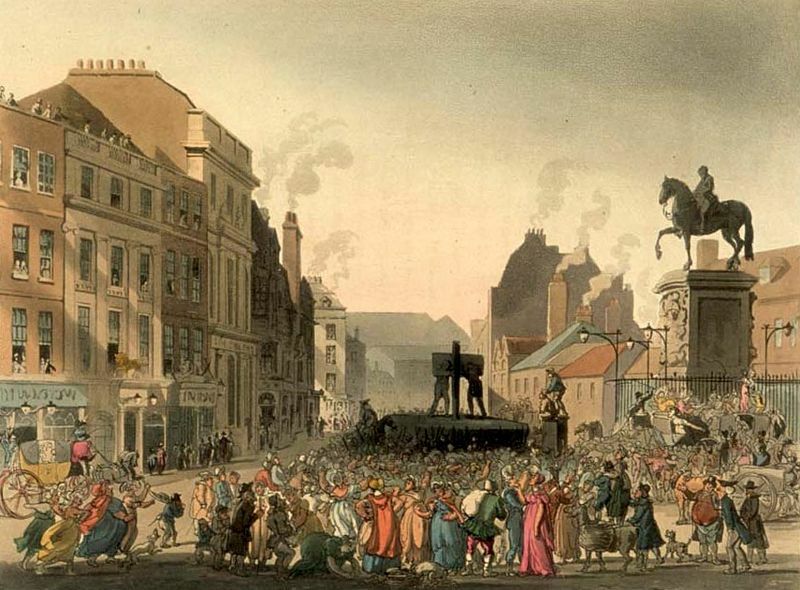 Bloomsbury was anciently a village named Lomsbury, in which were the King's stables, till they were burnt in 1354. Blossom's-Inn, Lawrence-lane, was so called from having for its sign St. Lawrence, the deacon, in a border of blossoms, or flowers. 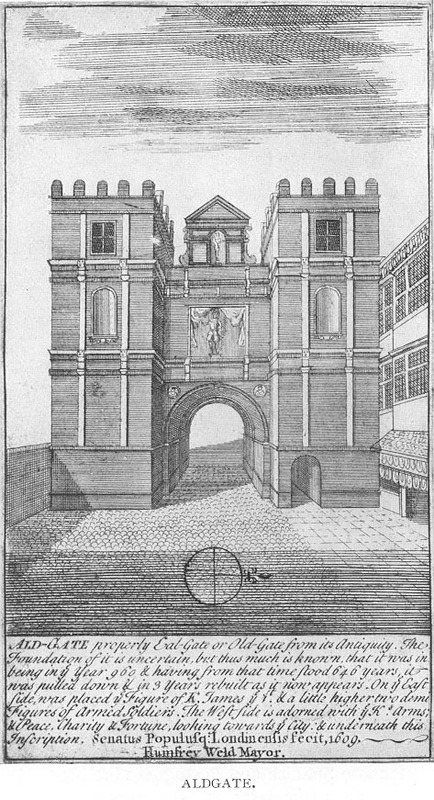 Bridewell, so called from its being near a spring called St. Bridget's, or St. Bride's Well, was formerly the King's palace, till, in 1533, Edward VI. gave it to the city as a workhouse for the poor. It was burnt in 1666, and rebuilt in 1682. Change (Old) was so called from the King's Exchange kept there for the coining of bullion, 6th Henry III. Cannon-row, from the Canons of St. Stephen's, Westminster, who dwelt there. Charter House, or more properly Chartreux (so called from the monastery which stood there, and was dissolved by Henry VIII.) was founded and endowed at the sole cost of Thomas Sutton, Esq. who purchased the house of the Earl of Suffolk, for 13,000l. 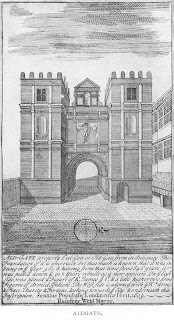 It was opened in October, 1614. The estate is now above 6000l. per annum. Cheapside derives its name from there being a market there, which in Saxon is a cheap. 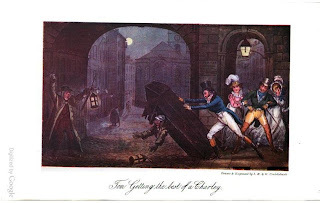 This came from an entertaining volume, whose title speaks for itself: The Spirit of the public journals for the year 1825: being an impartial selection of the most exquisite essays and jeux d'esprits, principally prose, that appear in the newspapers and other publications, Volume 3. Authors George Cruikshank, Robert Cruikshank. But part of what makes 18th c. gowns so memorable is the silk from which many were cut and sewn. 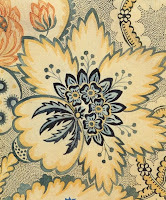 The English silk industry was based in Spitalfields, and one of the most prolific and influential designers of the time was Anna Maria Garthwaite (1688-1763). Anna Maria was born a clergyman's daughter from Leicestershire. Nothing is known of her artistic training, or of how she gained the necessary technical skills for working with scaling and repeats. How a genteel country spinster could have become such an accomplished artist in such a specialized field remains one of those tantalizing historical mysteries. Anna Maria moved to Spitalfields with her widowed sister in 1728, and soon found great success there, painting as many as eighty original watercolor designs a year. She sold her designs directly to the master weavers, who wove them into the large-scale brocades and damasks so popular at the time. Her patterns were distinctive for their swirling, asymmetrical interpretations of flowers and leaves, and her use of vibrant colors gives them a lively immediacy. 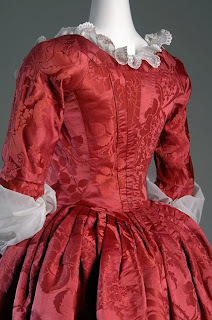 Spitalfields silk, and Anna Maria's designs in particular, were especially popular in the American colonies, who were forbidden to trade directly with France by England's Navigation Acts. Her bold damasks are identifiable in several colonial portraits, and remnants of her fabrics survive in many American collections. Unlike many female artists of the past, much of Anna Maria's work still exists. Hundreds of her watercolor designs, painted between 1728-1756, have been preserved in the collection of the Victoria & Albert. Even more fascinating are the existing examples of silk, both in lengths of fabric and made up into garments, that can be traced back to her designs. Though fashionable taste shifted away from her bold, over-sized patterns in the second half of the 18th c., Anna Maria's influence can be seen in the swirling patterns of late 19th c. Arts & Crafts and Art Nouveau textiles. It is, quite simply, beautiful stuff. 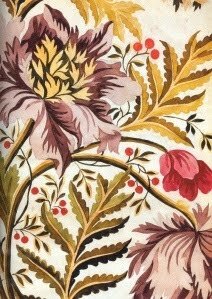 For more examples of her work, check out Silk Designs of the Eighteenth Century, which features her watercolors in the collection of the V&A. This blog also offers more detail about the Spitalfields weavers, as well as some glorious examples. Over at my author blog, I received the following comment regarding the 1828 wedding dress I posted. "I am struck by the fact that this is Ackerman's 1828 and yet the gown is white; telling my readers at HereComesTheGuide.com over and again that white was not a common wedding color until Victoria inaugurated the tradition, I am wondering if it was at all unusual for the 18th* century?" Well, I’d been under the same impression. 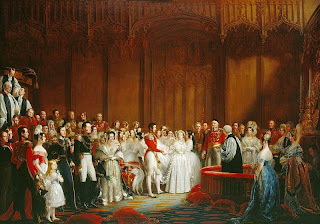 But, as is pointed out at one of the links I cited, there’s good evidence of white wedding dresses prior to Victoria’s wedding on 10 February 1840. At left is Exhibit A, a wedding dress of 1831. For a description, click here for my author blog. 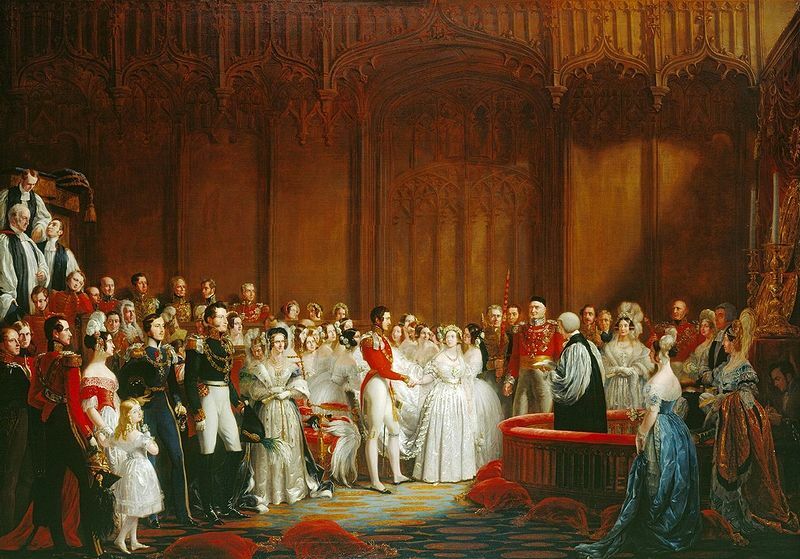 Below right is Queen Victoria’s wedding. Here are some mentions in pre-1840 books. in bridal white and silver." PRINCESS CHARLOTTE OF WALES WEDDING DRESS AND JEWELLERY (she was married on 2 May 1816)1. 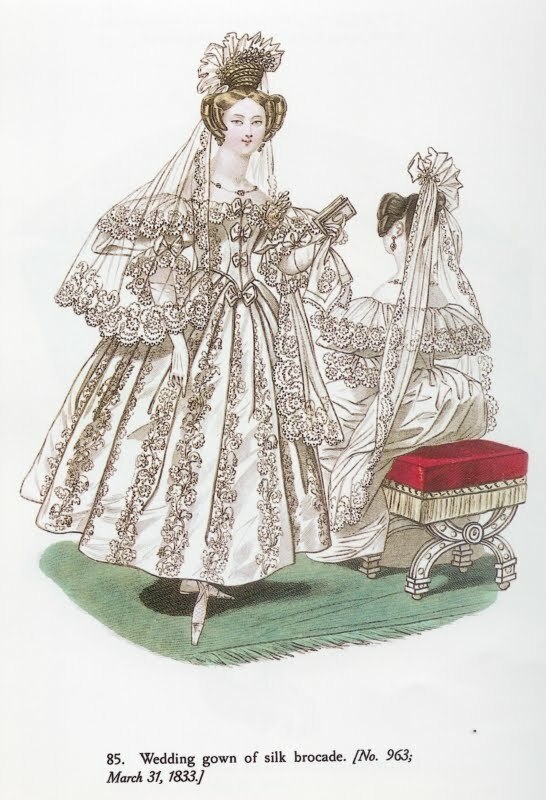 The wedding dress is a slip of white and silver atlas worn under a dress of transparent silk net elegantly embroidered in silver lama with a border to correspond tastefully worked in bunches of flowers to form festoons round the bottom the sleeves and neck trimmed with a rich suit of Brussels point lace. The mantua is two yards and an half long made of rich silver and white atlas trimmed the same as the dress to correspond. 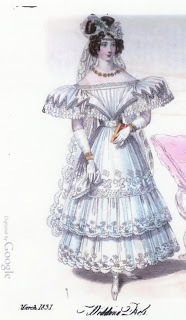 You can see a photo of her dress at the Hibiscus-Sinensis Regency pages, and read more on the subject there as well. We have, a few days ago, seen a dress which was completed for a young bride of high distinction; it was entirely of fine lace ; and was worn over a slip of white satin: a scarf of the same hung in graceful negligence over her shoulders. *Given the date of the dress I posted, I’m assuming she means the 1800s or 19th century. 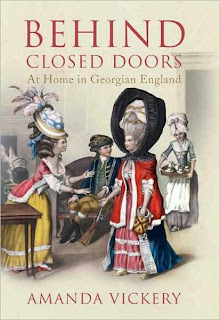 Anyone who'd like to comment on 18th century wedding dresses, however, is welcome to do so. Most of us self-diagnosed history nerds are familiar with snuff-boxes, and can easily imagine an 18th c. gentleman drawing such a box from his pocket to partake in his favorite sneezing vice. 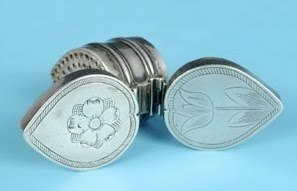 But from the late 17th c. to the early 19th c., a well-equipped male pocket might also include one of these little silver articles: a personal nutmeg grater. While nutmeg is a common spice to 21st c. cooks (my local grocery sells a half-dozen whole nuts for about $8.00), in the past it was a considerable luxury, grown only on the remote Banda Islands in the South Pacific. Nutmeg was known in medieval Venice, but it wasn't until the early 16th c. that Portuguese and Dutch traders made it more widely available throughout western Europe. Still, the rarity of the little nuts and the peril of securing them made nutmeg a costly status-spice into the 19th century. Perhaps nutmeg's rarity was the reason it was imbued with almost magical qualities. Herbalist John Gerard wrote in 1597 that nutmeg "is good against freckles in the face, quickneth the sight, strengthens the belly and feeble liver, taketh away the swelling of the spleen...breaketh wind, and is good against all cold diseases of the body." It was also thought to protect against the plague. But by the late 17th c., nutmeg was more often prized for its taste in cookery, and as an ingredient in the punches popular at the time. While punch today is usually a non-alcoholic kiddie-drink, 17th-18th c. punches could lay a grown man under the table in no time. Gentlemen prided themselves on having their own closely-guarded recipes. Customary ingredients included citrus fruits, sugar, and spices, mixed with prodigious amounts of alcohol: rum, brandy, cognac, canary, and just about any other liquor on hand. (Here's more about historical punch, plus several recipes if you're feeling brave.) The next groggy morning, a dusting of nutmeg could also enhance those other fashionable new drinks of chocolate and coffee. It's no wonder, then, that every trendy fop and gentleman carried his own nutmeg in his pocket with him. 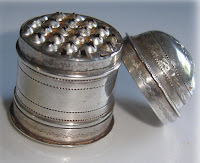 Not only did this display his excellent palate, but it also showed that he was wealthy enough to buy both the nutmeg and one of these little sterling silver boxes, engraved with his initials, for stashing it. In a time of pretty gestures, taking out one's grater to spice one's meal or beverage would have been a charming nicety, and offering the same to one's neighbor (especially a lady) at the table would have been even nicer. Any flirtation that could combine the senses was considered particularly seductive, and a fragrant grating of red-brown nutmeg, redolent of the exotic, must have inflamed the ladies indeed. I’m not sure there’s another place in England that can match Dartmoor for atmosphere. It’s certainly exerted a fascination over many authors. I discovered it as a child, in the Sherlock Holmes story, “The Hound of the Baskervilles.” I could write reams about the place, but will leave that to others. As it is, today's introduction to the setting of “The Mad Earl’s Bride” will be rather longer than I prefer. 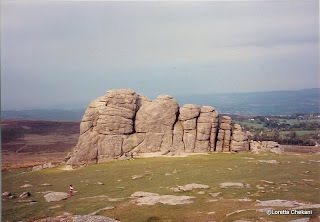 ‘DARTMOOR,' So named from the Dart, to which it gives rise, as it does to most of the rivers in Devon, constitutes the south-west part of the county on the north of the ' South Hams.' On approaching this tract from the south and south-east, the eye is bewildered by an extensive waste, exhibiting gigantic Tors, large surfaces covered with vast masses of scattered granite and immense rocks, which seem to have been precipitated from deep declivities into valleys. These huge fragments, spread in wild confusion over the ground, have been compared to the ponderous masses ejected by volcanoes, to the enormous ruins of formidable castles, and to the wrecks of mountains torn piecemeal by the raging elements. The Great Grimpen Mire (Grimspound bog) was my introduction to quicksand. Following is an oft-repeated story. A man is said to have been making his way through Aune Mire when he came on a top-hat reposing, brim downwards, on the sedge. He gave it a kick, whereupon a voice called out from beneath, " What be you a-doin' to my 'at ? " The man replied, " Be there now a chap under'n ?" " Ess, I reckon," was the reply, " and a hoss under me likewise." Fox Tor Mire once bore a very bad name. The only convict who really got away from Princetown and was not recaptured was last seen taking a beeline for Fox Tor Mire. 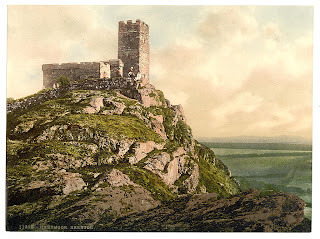 From Sabine Baring-Gold’s A Book of Dartmoor. * a forest, in England, does not necessarily include trees. For some early 20th photos, try Dartmoor illustrated: a series of plates of its scenery and antiquities, with some short topographical notes. … the vile practice now so much in vogue among the better sort as they are called, but the worst sort in fact; namely, the sending their wives to madhouses, at every whim or dislike, that they may be more secure and undisturbed in their debaucheries; which wicked custom is got to such a head, that the number of private madhouses in and about London are considerably increased within these few years. This is the height of barbarity and injustice in a Christian country, it is a clandestine inquisition, nay worse. …In my humble opinion, all private madhouses should be suppressed at once, and it should be no less than felony to confine any person under pretence of madness without due authority. 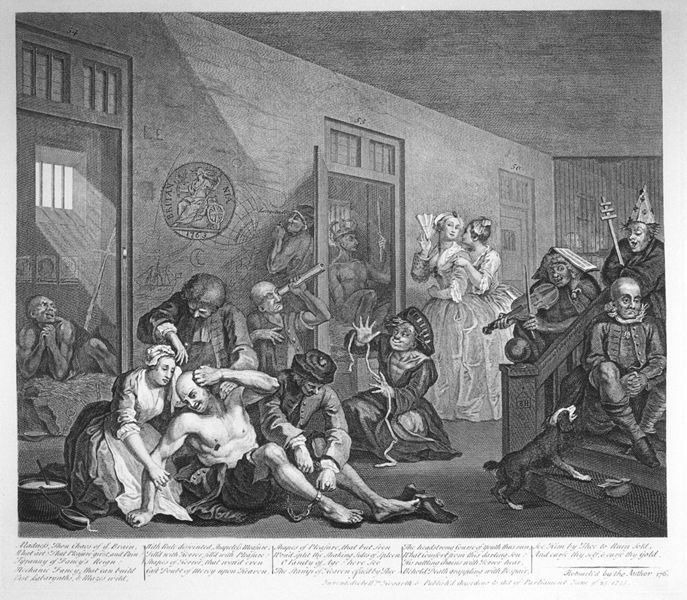 For the cure of those who are really lunatic, licensed madhouses should be constituted in convenient parts of the town, which houses should be subject to proper visitation and inspection, nor should any person be sent to a madhouse without due reason, inquiry, and authority. A lady of known beauty, virtue, and fortune, nay more, of wisdom, not flashy wit, was, in the prime of her youth and beauty, and when her senses were perfectly sound, carried by her husband in his coach as to the opera; but the coachman had other instructions, and drove directly to a madhouse, where the poor innocent lady was no sooner introduced, under pretence of calling by the way to see some pictures he had a mind to buy, but the key was turned upon her, and she left a prisoner by her faithless husband, who while his injured wife was confined and used with the utmost barbarity, he, like a profligate wretch, ran through her fortune with strumpets, and then basely, under pretence of giving her liberty, extorted her to make over her jointure, which she had no sooner done but he laughed in her face, and left her to be as ill-used as ever. This he soon ran through, and (happily for the lady) died by the justice of heaven in a salivation his debauches had obliged him to undergo. the more she repulsed him the worse he treated her, till at last he drove her mad in good earnest. 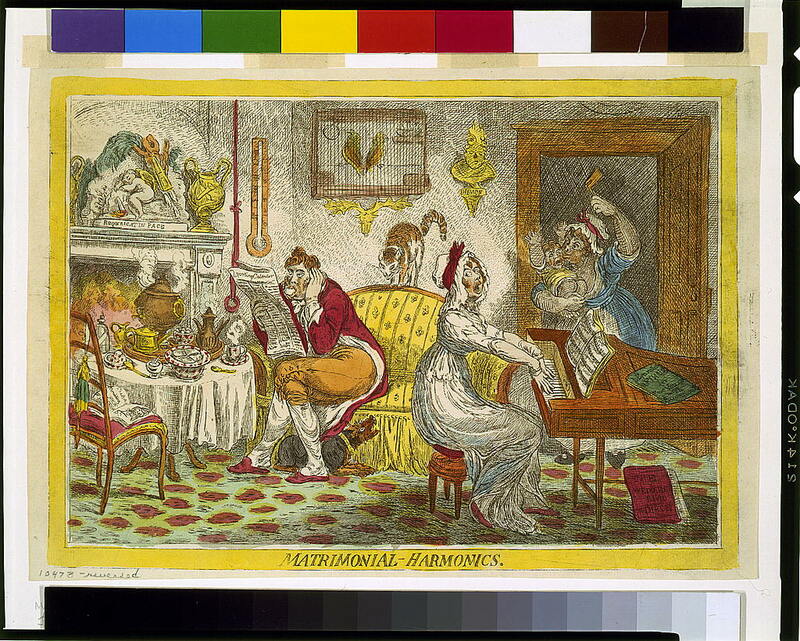 Her distressed brother, who is fond of her to the last degree, now confines her in part of his own house, treating her with great tenderness, but has the mortification to be assured by the ablest physicians that his poor sister is irrecoverably distracted. 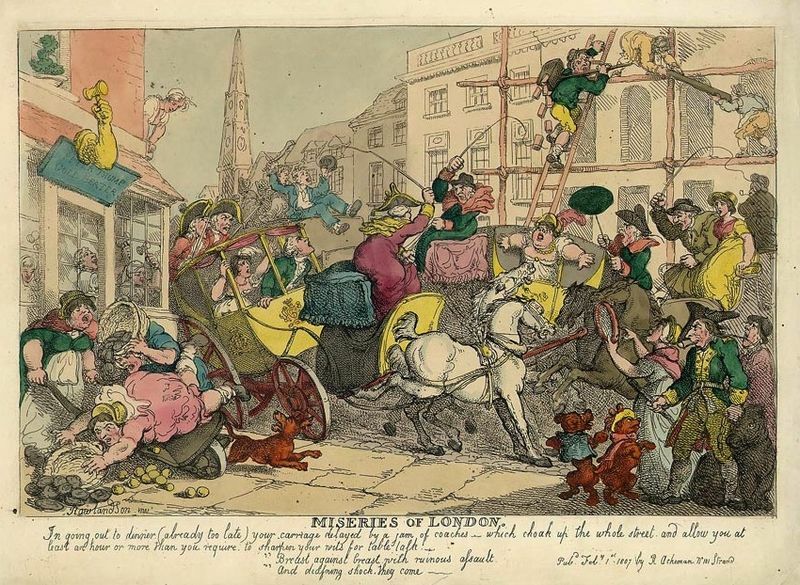 From Augusta Triumphans: or, the Way to Make London the Most Flourishing City in the Universe. The entire work is well worth a read. 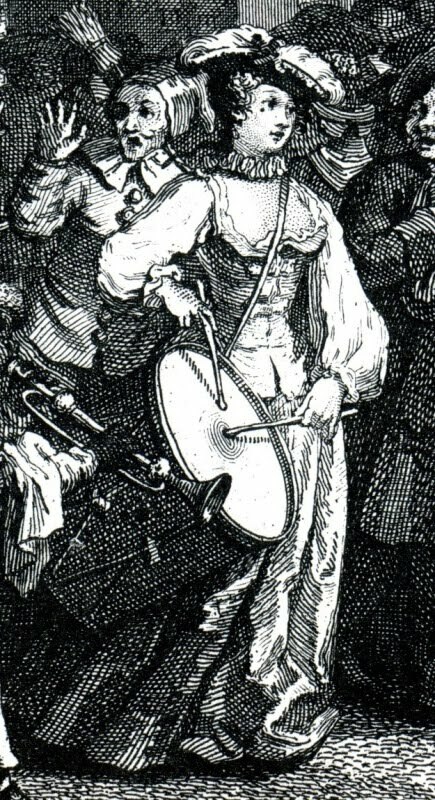 Yes, there’s that lady beating the drum again. It means a Nerdy History Girl has a new book to talk about. 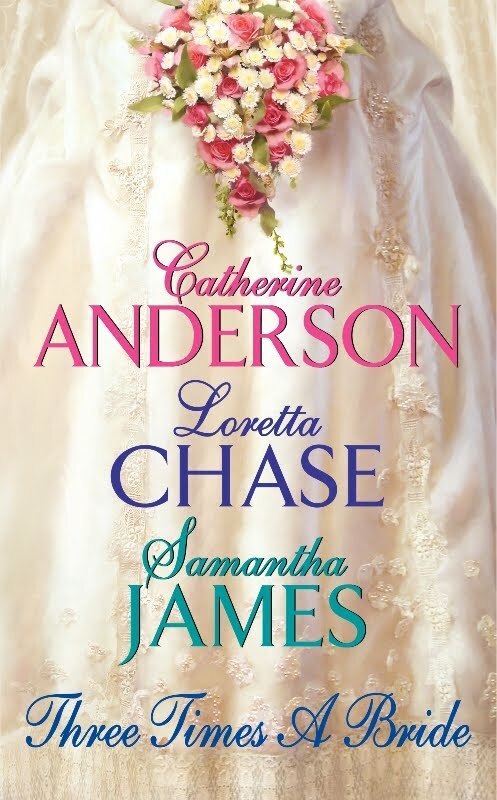 The anthology, Three Times a Bride, which was released this week, contains one of the few (i.e., two) novellas I’ve ever written. Later on I’ll report on some of the historical background. Today it’s more about the story, with a digression via link to bridal gowns. Though it’s 1828 and woman are simply not allowed to go to medical school and earn a degree, Gwendolyn Adams is determined to be a doctor. So it makes perfect sense to her to marry a gentleman who's terminally insane. The mad gentleman with the short lifeline is Dorian Camoys, the Earl of Rawnsley, and he’d rather take his chances with quicksand than with the crazy girl who chases him across Dartmoor. 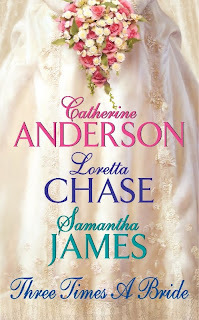 Look for an excerpt at Loretta Chase…In Other Words sometime this week (no, I'm not the most efficient self-promoter). For now, I invite you to compare and contrast the wedding gown on the cover with what Gwendolyn might have worn, had hers been a conventional wedding. The heart of every great household of the past was the kitchen, and its master was the cook. No matter how noble or wealthy a family might be, their reputation for hospitality rested on the skill of their cook. General George Washington (1732-1799), first president of the new United States of America, was well aware of the importance of his cook. He brought his own cook from his home at Mt. 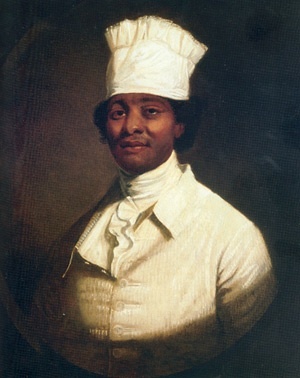 Vernon to run the kitchen of the presidential residence in Philadelphia in 1790. Known by the single name of Hercules, he was reputed to be the very best cook in America, one who could not only produce the most elaborate dishes, but also insist on perfect order among his large staff and spotless cleanliness in his kitchen. Washington spoke proudly of the "labors of Hercules" when the first exquisite dishes were set on his table each night. Even on his days off, Hercules set himself apart, dressing with such impeccable style that he was recognized and saluted by name as he sauntered down the Philadelphia streets. Only one thing set Hercules apart from his lofty counterparts in the great houses of Berkeley Square in London: Hercules was a slave, and President Washington owned him. Hercules understood the difference, too, and like so many slaves, must have dreamed of freedom. In 1796, Hercules's son Richmond was caught stealing money from the household, and Washington suspected (correctly) that his cook was planning his escape. The next mention of Hercules in the Mt. Vernon records is not of him in his kitchen, but of being put to hard labor breaking clay and spreading manure with his son in the fields: a punishment clearly intended to provide a humiliating "lesson" to the proud, accomplished cook. But Hercules's spirit must have remained strong. Soon after, on February 22, 1797 –Washington's 65th birthday – Hercules escaped, his disappearance marked down in the records by the single word "absconded." It's likely that the president did all he could to recover Hercules after his escape. A skilled cook was an extremely valuable slave to lose. Like most plantation owners, Washington was relentless in his pursuit of what he regarded as lost property, and his agents had once hunted other escaped slaves clear to Canada. But Hercules was never caught. While he probably escaped from Virginia back to Philadelphia and the early abolitionists who were already assisting fleeing slaves in the 18th century, no one knows for sure where he went from there. He was too well-known to remain safely in America, and most historians guess that he made his way to Europe. 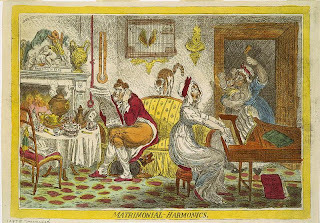 There his culinary gifts could have earned him a place ruling the kitchen of some gentleman powerful enough to protect him, and considering the lavish entertainments popular in late 18th c. London, he would have been a prize indeed. It's fascinating to imagine Hercules in that multicultural world, a dandified Virginian cook in the age of William Wilberforce - and Beau Brummell. Wherever Hercules ended up, within four years he was no longer a fugitive, but a free man. Washington died in 1799, and by the provisions of his will, he emancipated all his slaves, including Hercules. (To his considerable credit, Washington was the only one of the slaveholding Founding Fathers to do so.) Click here for more information about Hercules and his life as Washington's cook. Above: This portrait is traditionally called a portrait of Hercules, painted in the late 18th c. by Gilbert Stuart (1755-1828.) But just like the other mysteries of Hercules's own life, no one now knows for certain. . . .
One of my prize possessions is a falling-to-pieces copy of Pierce Egan’s Life in London: or, The day and night scenes of Jerry Hawthorn, esq., and his elegant friend Corinthian Tom, accompanied by Bob Logic, the Oxonian, in their rambles and sprees through the metropolis. 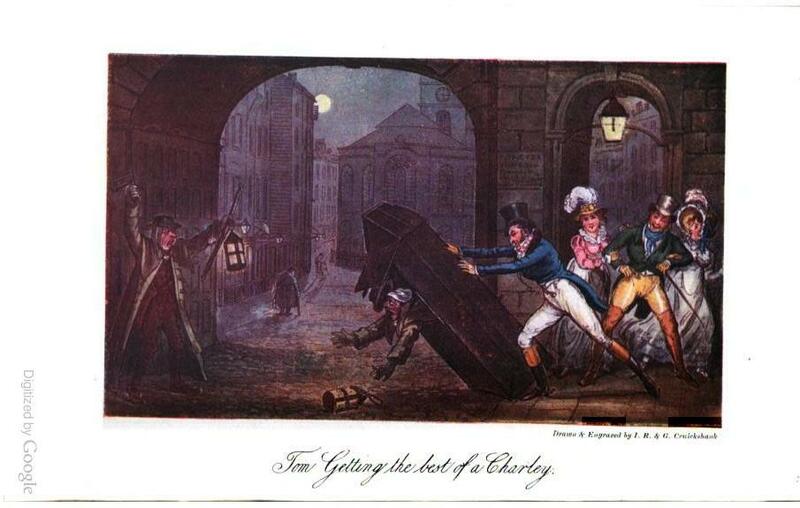 It’s beautifully illustrated by George &Robert Cruikshank. Issued in shilling numbers starting in July 1821, it was hugely popular and remained so into the 20th century. Basically, it’s a book about Men Behaving Badly. As the excerpt demonstrates, it’s written in the arch style favored at the time, it’s loaded with incomprehensible slang and obscure puns, and there’s no obvious rhyme or reason to the italics. Yet the picture it offers of men of the era helps us understand why Conan Doyle, in Rodney Stone, described a character thusly: “He was a type and leader of a strange breed of men which has vanished away from England--the full-blooded, virile buck, exquisite in his dress, narrow in his thoughts, coarse in his amusements, and eccentric in his habits.” This isn’t Mr. Darcy by a long shot, and while I don’t doubt that Jane Austen’s hero had his counterparts, I suspect the Corinthian Tom type was easier to find in real life. Certainly the strong Victorian reaction against the type tells us that such men were far from rare. Here's an early 20th C assessment of the book. And here's a 1904 edition at Google Books. Last month, I posted here about an 18th c. children's pull-carriage that Loretta and I had seen in Colonial Williamsburg. 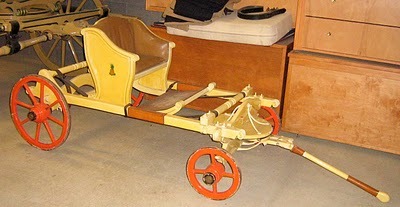 The carriage is a reproduction, made several years ago by CW craftsmen, and is a favorite with visiting children. Several of our readers asked if it was an exact replica of an original, and offered 18th-19th c. illustrations as possibilities. 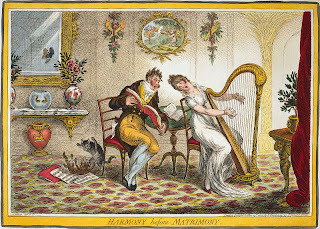 (My favorite was this one by Gillray, and thanks again to Michael Robinson for the link.) I didn't know; as much as I scribble in my little pocket notebook, it doesn't have all the answers. But on my most recent visit to CW, I did remember to ask the experts in the stables. Their reply: this splendid yellow children's pull-carriage is a composite of several original 18th c. sources, a design very much in the spirit of existing models, if not an exact copy, and made with 18th c.-style tools and materials. And yes, I still believe that any child, whether living right now or two hundred years ago, would be absolutely thrilled to have one. Regular people stop and smell the flowers. Nerdy History Girls stop and look at old stuff: houses! barns! graveyards! battlefields! stone walls! Meandering about the countryside is an occupational hazard of being a NHG, which is why I always drive Rte. 301 through Virginia and Maryland instead of the faster but less picturesque 95. There's always much more to be seen when one is not dodging semis doing eighty. Port Royal was first settled in 1652 and was chartered in 1744. Tradition says that Port Royal was named after the Roy family. a ferry service, and a tavern. Dorothy Roy was the first woman entrepreneur in the colonies. These chimneys are all that remain of the Roy home. Now that was worth stopping for, and thoroughly impressed, I drove home, mulling over this interesting history ("the first woman entrepreneur"!) that was new to me. I was eager to learn more beyond tradition. Trouble is, however, that there doesn't seem to be that much more to learn. Through genealogy sites, I've discovered that Dorothy Buckner was born in Port Royal about 1657, that she was first married to William Smith, widowed, and then wed John Roy, who was born in England in 1659. Dorothy had several children with each husband, including a daughter who married into the famous Chew family. John Roy bought Dorothy's father's tobacco warehouse, established in 1673. When John died, Dorothy inherited all the family businesses, which is how she earned that entrepreneur status. But beyond those few tantalizing facts (and I'm not even sure of those, since they're from web sites rather than more trustworthy original sources), I can't find much else. What was Dorothy's life like as a woman of property in what must have still been a pretty rough colonial port town? (Port Royal's founder was killed fighting Indians in 1670, so English 'civilization' wasn't quite as firmly entrenched in the area as it might have wished.) How educated was she? Did her businesses prosper? Was she engaged in the day-to-day transactions herself, or did she turn everything over to male managers? Or, having been born in the colony, was she the one who'd always run her husband's businesses, even before she inherited them at his death? All questions, no answers, and those chimneys aren't talking. Yet. 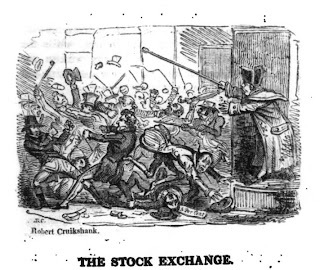 Given the puzzling behavior on Wall Street here in the U.S. and the financial crises abroad, I wanted to share this little poem from the early 19th century. HAVE you ever seen Donnybrook fair? Or in a caveau spent the night ? To engage in the terrific fight? At the risk of your pockets and head ? Or in Banco been fixed by the bums ? When pigeons were pluck'd by the bone ? When our Fourth George ascended his throne? Been floor’d by a rush from the press? You to visit a bull-bait or fight ? In a watch-house been lodged for the night? Of a group, just to bother sage Birnie? Being fleeced by the watch and attorney ? With the Mayor and his corporate souls? With dealers in tallow and coals? This is from a very entertaining book, The Spirit of the public journals: being an impartial selection of the most exquisite essays and jeux d'esprits, principally prose, that appear in the newspapers and other publications, Volume 3. 1826. 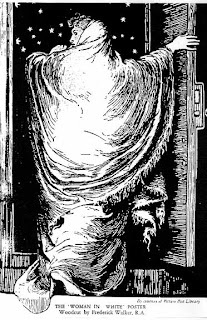 Black & white illustration by Robert Cruikshank is from the book. Color illustration of King George IV’s coronation banquet, 1821. We're in the merry month of May Day and May poles. While most of us today think of May poles with school children clutching the ribbons, that sweetly pretty version is a Victorian invention. Earlier May poles were much less innocent, with pagan antecedents so distant that no one knows exactly when the first was, ahem, erected. "All the young men and maids, old men and wives, run gadding over night to the woods, grove, hills, and mountains, where they spend all the night in pleasant pastimes; and in the morning they return, bringing with them...their May pole, which they bring home with great veneration, as thus: they have twenty or forty yoke of oxen, every ox having a sweet nose-gay of flowers placed on the tip of his horns, and these oxen draw home this May pole (this stinking idol, rather) which is covered allover with flowers and herbs, bound round with strings, from the top to the bottom, and sometimes painted with variable colours, with three hundred men, women, and children following with great devotion. And thus being reared up...they fall to dance about it, like as the heathen people did at the dedication of the Idols....I have heard it credibly reported (viva voce)...that of forty, three-score, or a hundred maids going to the wood over night, there have scarcely the third part of them returned home again undefiled. These be the fruits with which these cursed pastimes bring forth." 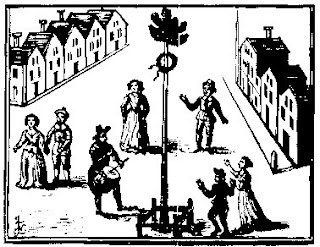 Above: The May-pole Dance, c. 1620. While there are many written descriptions of 17th c. May poles, both in their favor and against them, this demure illustration is the only contemporary one that I could find. Perhaps all the artists were too busy running into the woods? I’ve been dying to talk about Behind Closed Doors because it’s a perfect Nerdy History Girl book, loaded with all kinds of fascinating details about life in bygone days. 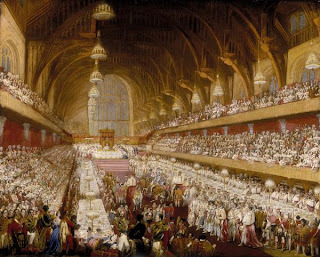 In this case, the days belong to what author Amanda Vickery calls “The Long Eighteenth Century”— from about 1688-1832 (the Glorious Revolution to the Great Reform Act). 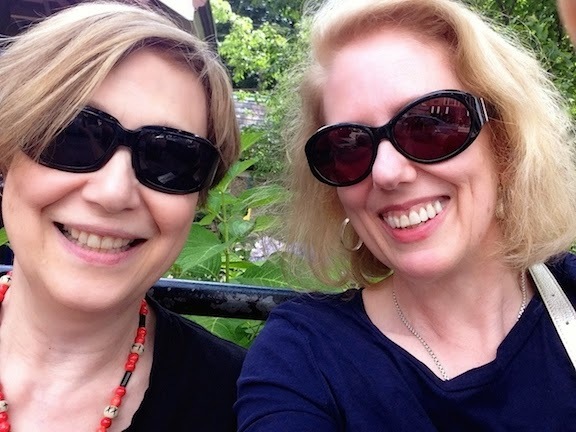 While this includes early to mid-nineteenth century, an era I’m more familiar with, she’s surprised me again and again, and offered the kinds of historical tidbits (aka fresh history gossip) Susan and I delight in. One shocker was the attitude toward marriage. 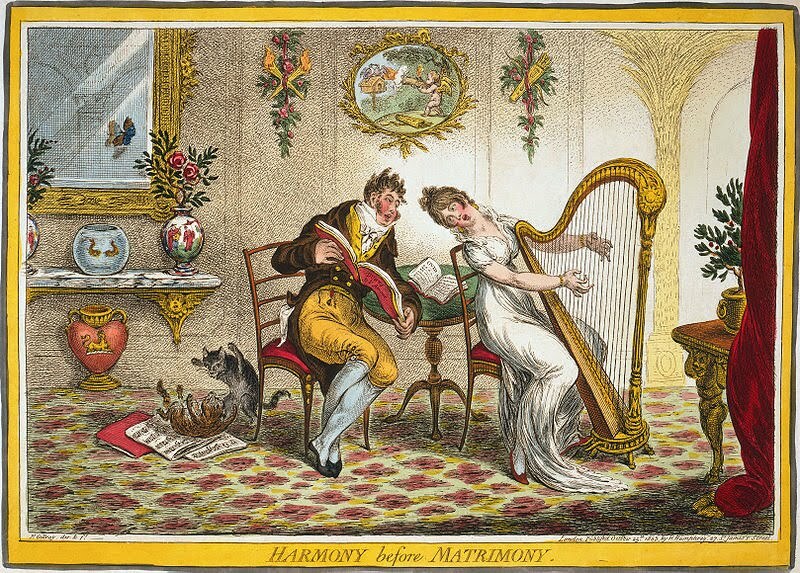 We Regency writers learned early to refer to marriage as “parson’s mousetrap,” and to assume that a man happily sowed his wild oats until a clever girl came along and stole his heart. These are only two tidbits. Susan and I will have more to say about this delicious book in weeks to come. Meanwhile, here’s a proper review. And here, in accord with some FTC rule or other (which probably doesn’t apply to us, since we're not reviewers, but never mind), you need to know that, unlike the majority of books referred to in this blog, which Susan and I buy with our own hard-earned cash, this one came gratis.